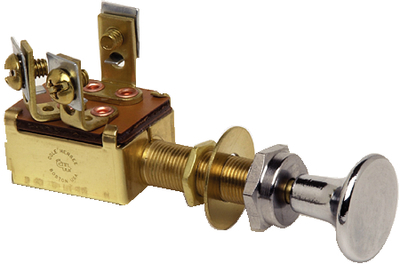 All switches feature non-corrosive construction and will work from 6-36VDC. Gasket sealed case protects against moisture and dust. Mounting stems are 3/8" diameter and are complete with chrome plated brass knob & face nut, washer, and hex nut for mounting. Mount in panels up to 1" thick. Rating 10A @ 12VDC. 3 circuit. Normally off. 3 positions: off-on #1, on #1 & #2. knob face diameter: 3/4". Ideal for control of lighting circuits such as cabin and running lights.